IRONWORKS opens the door for your business to achieve its next level of success. Centrally located in Port Town, East Vancouver, BC, IRONWORKS is a unique commercial real estate offering, presenting an innovative selection of new office spaces, mixed with industrial, warehouse and showroom space. You’ve dedicated years to your business and you’ve paid your dues. Your hard work is paying off and now is the time to step it up another notch. IRONWORKS provides the right environment for you and your team to aspire, create, and show the world what you’re made of. Its functional office and industrial spaces whisper, “Practical commercial real estate investment.”, while their modern design inspires and excites. Proudly accented by rich modern finishes including glass, iron and wood tones that complement its streamlined architecture, IRONWORKS is the first of its kind, consisting of two commercial buildings with stacked layouts and an ideal mix of loft office space, showroom, and warehouse flex spaces. The Pandora and Franklin Buildings are separated by a central landscaped mews, with a common dock loading area, individual loading for each unit, and parking for visitors. The Pandora Building offers stunning views of the Vancouver waterfront and North Shore mountains. The modern stacked building layouts, unique to IRONWORKS, are highly functional and the result of a forward-thinking vision for industrial design and development. Let IRONWORKS and the thriving East Vancouver neighbourhood of Port Town be the catalyst for your business success in 2017. If you’re considering purchasing commercial space in Gastown, Mount Pleasant or other areas of Vancouver, don’t miss out on what IRONWORKS and this unique Port Town neighbourhood have to offer. This Terminal City Iron Works property is like none other in the area – a full city block with rich industrial history and community roots formed by the contributions and accomplishments of TC Iron Works Ltd. 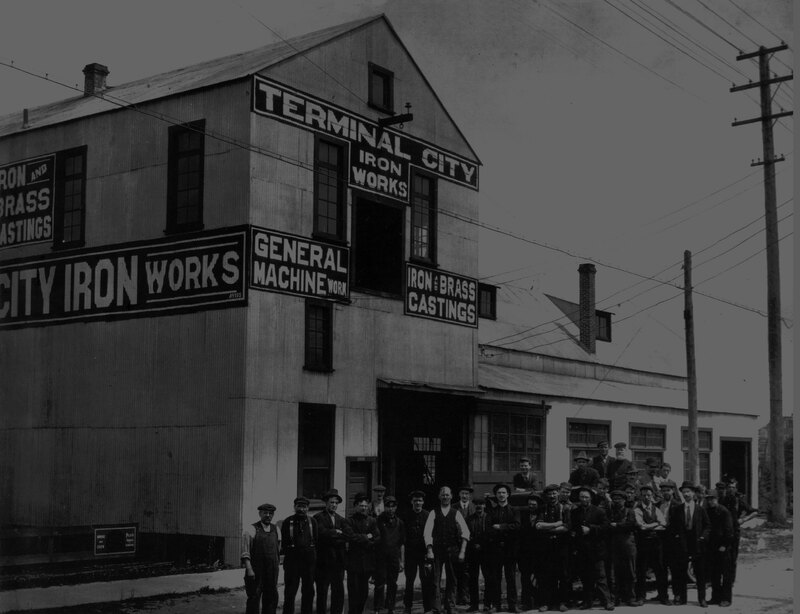 The original Terminal City Iron Works Company was an exciting new-age industrial manufacturer in the early 20th Century. Built in 1906, it was founded by three key members of the community – James Mason, Harry J. Littler and Thomas W. Littler. TC Iron Works Ltd. was instrumental in helping create new communities by providing municipal waterworks products to emerging towns all over British Columbia, such as hydrants, gas valves and fittings. TC Iron Works Ltd. also contributed significantly to the Canadian war effort in both World War I and World War II through the production of war products, like explosive shells – some of which were award-winning. Towards the turn of the century, TC Iron Works opened its doors to filming on site, and over the years became an iconic location for many well-known film and television shoots. The TC Iron Works property has been relevant and forward-thinking in industry for over a century. Today’s IRONWORKS development is repurposing this property so it continues to be relevant far into the future. The Conwest Group has re-envisioned typical industrial use and created an innovative, contemporary building that will be a flagship in the Port Town community of Vancouver. TC Ironworks Ltd. was instrumental in the making of new communities, providing municipal waterworks products to emerging towns all over British Columbia, such as hydrants, gas valves & fittings. Built in 1906, it was founded by James Mason, Harry J. Littler and Thomas W. Littler. TC Ironworks Ltd. also contributed significantly to the Canadian war effort in both World War I and World War II, finding an opportunity to expand their production to include war products like explosive shells. Excellence in their field led to receiving an award for Accuracy of Workmanship for 18 lb. explosive shells. Towards the turn of the century, TC Ironworks opened its doors to filming on site. Over the years, the TC Ironworks property became an iconic location for film shoots. Many well-known films and television shows shot on-location at TC Ironworks, including The X-Files, Smallville, Supernatural, Stargate, Dark Angel, Catwoman and, most recently, Deadpool. The TC Ironworks property has been relevant and forward-thinking in industry for over a century. Today’s Ironworks development is repurposing this property so it continues to be relevant to industry far into the future.